Not everything is about holding the line. Unlike previous version of the Need For Speed franchise, Criterion forgoes all forms of story and lend their focus purely on the interaction between the cops and racers experience. You are set in the fictional world of Seacrest county, which was co-developed by the guys at DICE to produce a staggering 100 miles of roadway to race on. If you want to explore these roads without dealing with the racing aspects, you can enter the Freedrive mode that drops you in the world near the race you selected. It would have been more useful if they added cops into this mode, just to add an extra layer to the single player, however it was clear the game was not focused on this aspect. The races however — with exception to Interceptor — are much more linear than initially led to believe, introducing arrow barriers that prevent you from leaving the confines of the race. Whether you play on the Cops or Racers side certain missions will give you access to equipment that will help you evade cops or bust racers. The equipment offers a unique and balanced blend ranging from EMP strikes and Roadblocks to Turbo and Helicopters. Each race earns you Bounty which adds to your rank on the cop and racer side respectively. As you earn more Bounty, your rank increases unlocking new vehicles and upgraded equipment. 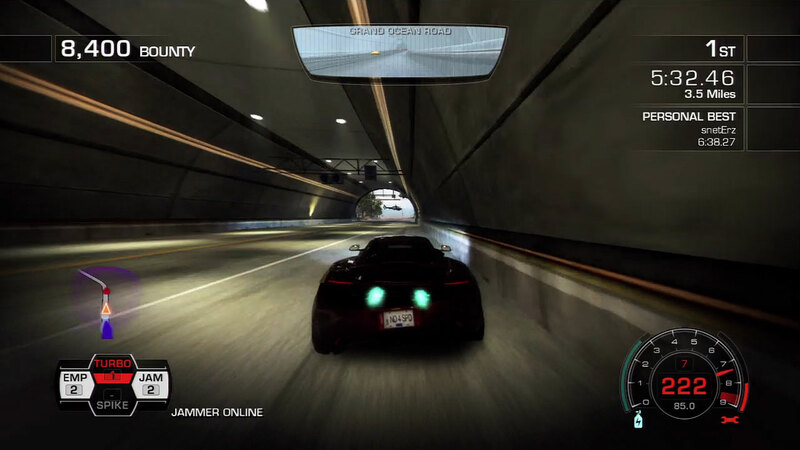 Single Player offers up a variety of mission types from generic racing, to outrunning cops solo in Gauntlet, or in a group race with other AI. Cops can participate in Interceptor missions or Hot Pursuits trying to either bust the racers or shutdown the race by busting all racers involved. There is a slight benefit to playing as the cops, with more powerful cars that can hit harder and cause more damage to racers. Each side comes with five tiers of vehicles from high end sports cars to high speed exotics. For the most part both sides of the spectrum get equal cars, with the cops edging out with a few more specialty vehicles. The Game is not terrible difficult at first, though as you progress, the A.I. quite suddenly becomes increasingly challenging and more intelligent about its driving decisions, and becomes more aware of your presence. The cops are especially ruthless in the later missions, treating your car like it’s a micromachine, tossing it across the road with immense force. There is definitely a rubberband feel to the racing to keep all the action tightly packed and ultimately more interesting for the player. The game seems to accomplish this by giving more boost to players in last or slowing down the AI in single player. For the most part we get a decent explanation of how each mission type and piece of equipment works, however it lacks the foresight to explain any changes in the ruleset compared to what was initially introduced. This is most notable during Interceptor missions when the “Suspects” car suddenly pulls a u-turn when you are way out in front to lay a spike strip and weren’t prepared as most of the game is in a linear racing format. It will take upwards of 15 hours to get through all the missions in single player. Autolog was introduced in this title that adds a significant amount to the experience and garners some rivalry between friends. It’s basically a Facebook for in game communication to know what your friends are doing in the game, and whether they beat your times, or post photos from in game. Autolog also is viewable from the Need For Speed website, showing the same information, and allows for downloading images, and commenting about recommendations online. Holy ****, that was crazy. 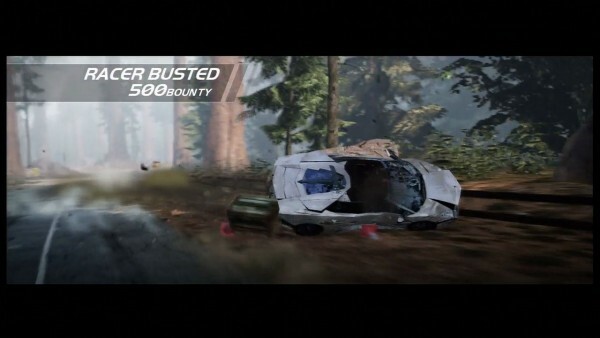 Hot Pursuit also features some influences from Burnout that crept into later renditions of Need For Speed. Such mechanics as oncoming traffic, near misses, slipstreaming and drifting to gain more boost. We also get the formula for explosively awesome crashes when you hit roadblocks or traffic. The cars also feature a familiar heavy feel to them and are designed for drifting through most turns, with exception to the exotic and hyper cars that offer a great deal more control. 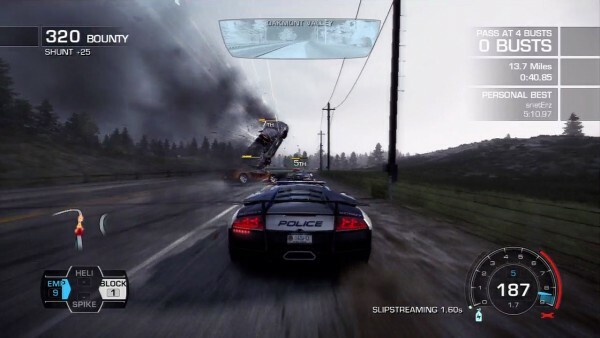 While the gameplay was inspired heavily from Burnout, Criterion did a great job in defining each title into a distinct experience, and overall achieved the Need For Speed feel. The most exhilarating part of this new experience hands down is playing against other players online. 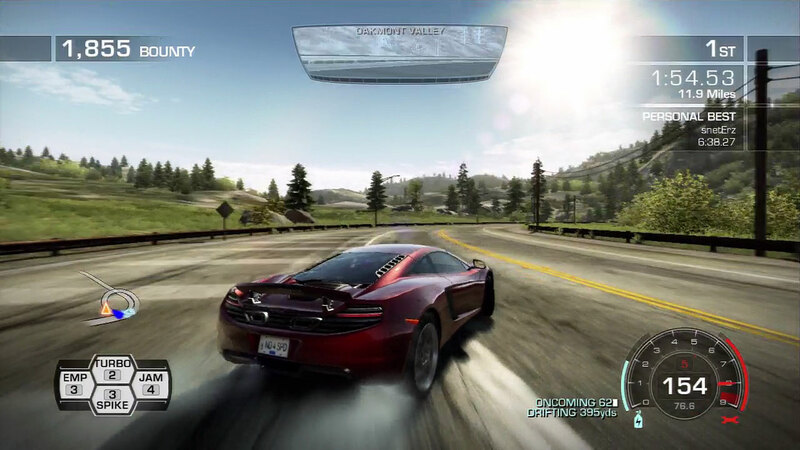 Multiplayer comes with three modes; Hot Pursuit, Interceptor, and Race. Hot Pursuit offers up an eight player cops vs. racers battle to the finish line, which is easily the best aspect and most balanced of the online modes. Interceptor pits you against another player as a cop or racer, and your job is to evade or bust the other player depending on the side. Depending on the cars you have really determines how easily you can accomplish this task, and being a good driver helps a lot too. Finally if you are just looking for some basic racing action, Race is the perfect mode for you. There is a slight disparity when new comers are in a race that don’t have all of the vehicles. While the game gives you access to a car in each tier, they are not as powerful as the top cars in the class, and will be difficult to compete with others. The equipment upgrades function in a similar way, as someone with a full on level 3 roadblock will be more effective then a player with level 1. This lends some incentive to play through the single player first to further enhance the multiplayer experience. If you really don’t want to tackle the single player though, playing online will net you bounty to rank up your character for new cars and equipment upgrades. Perhaps the most important part of the online experience is being able to play with your friends in a race. However if you don’t have eight friends to race with, trying to join a game can be down right frustrating. I found myself having to bounce through menus trying to join friends in a public game. There is an option to set a private game to public, but a majority of the time the game could not find anyone to match us with. Otherwise you can expect to enjoy an solid, engrossing online adventure that any Need For Speed fan will enjoy. Turbo really helps you escape the cops, although helicopters don't mind. Hot Pursuit boasts some exceptional visuals, spreading across vast environments, weather conditions and day to night cycles. The levels are fabulously detailed, and look great at high speeds. Rain slicked roads look brilliant and reflective, and help sell the overall presentation of the environment. Between the various climates in the world, from snow to desert, everything blends together nicely and looks the part. Vehicles pump in the polygons to offer accurate reproductions of high end exotics and sports cars. It’s a real shame to see them wreck into objects, but when it happens, it’s a beautiful sight to behold. 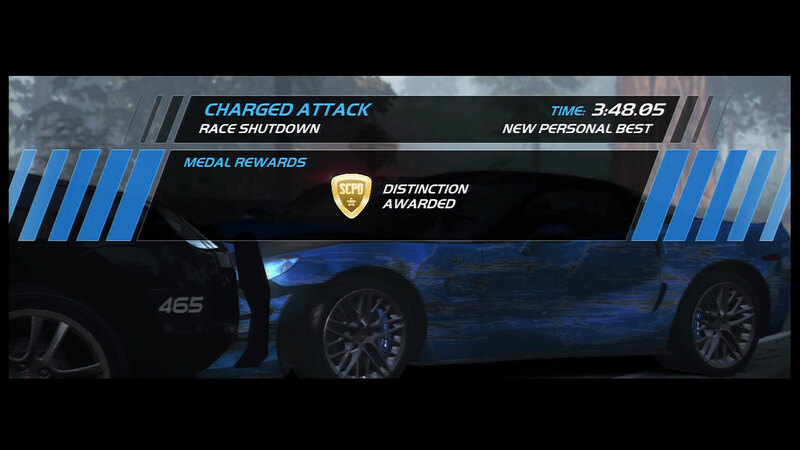 Pieces of metal and glass fly everywhere as your car explodes against roadblocks, traffic, and other racers. The game pumps out at a solid 30 frames per second, with a few hiccups here and there during more intense action sequences involving rain and lots of crashing. Accompanying an elegant visual parade, comes intense audio mimicking vehicular engines and cop sirens to boot. All of the cars seem to contain their own unique engine sounds — such as the Pagani’s high pitch tone, much akin to Ferraris — all while seemingly avoiding the pitch shifting that can sometimes be used in racing games. There is a garden variety set of tunes to enjoy as you race through the area ranging from rock, hip-hop and electronica. Like most racing games, eventually the music will wear thin; at least till then, the music does a great job of keeping you pumped up during the races. Besides the track-list, the game features some themes during cop chases that add to the experience, however the selection is really limited in that regard. Like most racing games, it’s also good to have your own custom selection of music to jump to when things get mundane. You punks got shutdown...with distinction. The extraordinary talent of Criterion had some big shoes to fill in an attempt to revitalize the franchise. Taking the title back to its roots and reintroducing younger audiences to old school Need For Speed, acted as a catalyst for future titles to follow on. Boasting exhilarating action and enjoyable online events, Hot Pursuit has what it takes to bring fans back to the series. We can only hope that this trend continues to move Need For Speed forward in new and exciting ways. This is a must own title for enthusiasts and new comers alike.